Holcomb and Hoke is NO MORE! Due to a cancellation of bank credits, Holcomb and Hoke closed their doors in early 2009! James I. Holcomb and Fred Hoke founded the Holcomb & Hoke Manufacturing Company in 1896. Their first foray into coin operated machines came in 1914 with the spectacular Butter-Kist popcorn machine. These extremely successful machines were produced for 21 years, creating sales in excess of $20 Million. In 1921 Homer E. Capehart – later to become the Jukebox King of the United States – joined Holcomb & Hoke, and quickly became their top sales manager. Based on their existing expertise in coin operated novelty devices, Holcomb & Hoke decided in 1926 to enter the market for coin operated phonographs, thereby creating the foundation for the modern jukebox industry. Holcomb & Hoke was prompted to buy the only proven jukebox mechanism available, the Deca-Disc, which the company had improved to a playing capacity of 10 records. 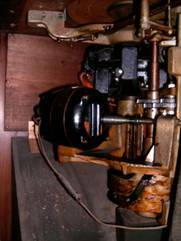 They combined the mechanism first with an up-to-date acoustic orthophonic horn, and shortly later with a modern electronic amplifier and loudspeaker. Frank Hoke also took the original idea from Deca-Disc of phonograph with a lighted advertising display and designed an attractive cabinet with a lighted back display with moving cloud effect. Both the acoustic and electronic Electramuse were sold at attractive price points, and in 1929 the more classically shaped versions of the jukebox – the Auditorium and the Park models – were introduced for clubs and hotel lobbies. The Electramuse was marketed to business owners in much the same manner as the popcorn machines. 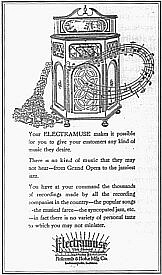 While the jukebox played any standard ten-inch record, owners were encouraged to obtain music through the Electramuse Record Exchange Service. Under this program, subscribers received a shipment of records every two weeks. While merchants were delighted with the opportunity to select the music of their liking at discounted prices, their patrons were anything but in having to settle for whatever song happened to be next up, rather than being able to choose. The Electramuse had not the desired effect with the public in spite of Holcomb Hoke’s promotional and marketing efforts. 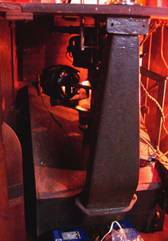 In 1930, after having lost more than half a million dollars, Holcomb & Hoke ceased production of the Electramuse. Frank J. Hoke states in an interview that there was only one thing wrong with the machine: It was not selective! Production numbers for the acoustic Electramuse Grand are estimated at 100, for the electric Electramuse Super-Tone at 3000. An additional twist to the Electramuse story is the energetic and enterprising personality of Homer E. Capehart – the future king of the jukebox. Being involved in the sales and marketing of the Electramuse, he discovered an even better record changer – the Orchestrope. Instead of playing just one side of 10 records like the Electramuse, the Orchestrope played 28 records on both sides, providing a sequential play of 56 titles! Capehart bought the Orchestrope in 1927 without management approval, and Holcomb was not impressed at all with their top salesman’s actions: They fired him. Capehart set up his own company, and by July 1928, he had already sold his first 625 Orchestropes at a price of $785.50 each ($2 cheaper than the Electramuse Grand !). Homer Capehart continued expanding in the jukebox market and made a daring move into home entertainment in the middle of the Great Depression: He launched the luxury line of THE CAPEHART turn-over changers for the upper-class homes of the United States. Fired again from his own company in 1932, Capehart sold himself and the famous selective Simplex mechanism to the Wurlitzer company. As Wurlitzer’s General Sales Manager, Capehart led the company to its meteoric rise as the icon of classic jukeboxes of the 1930s. 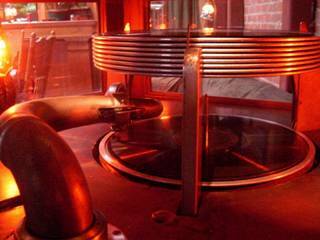 The Electramuse Grand is a sequential coin-operated jukebox with 10 records. 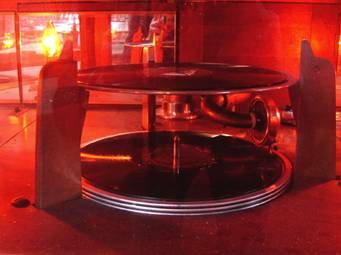 The drop changer automatically restacks the records in the magazine, providing continuous play without the need for restacking by the operator. 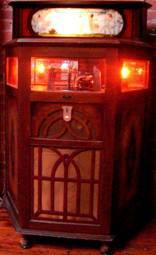 The lighted player compartment draws attention to the changer function in the manner of the novelty coin-ops of the 1920s. 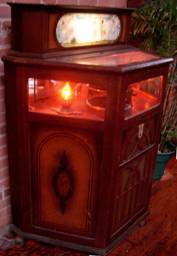 The ornate mahogany case with slanted sides has a glass top. The lighted player compartment draws attention to the changer function in the manner of the novelty coin-ops of the 1920s. An attractive illuminated advertising display in the back has moving cloud effects provided by a rotating cylinder. The panel is made of two panes of glass: one with the image of the dancing nymphs, and one behind it, separated by about an inch, painted as a gray shadow mask to simulate movement of the clouds, water, and nymphs as the motion lamp rotates. The Grand model is an acoustic machine, which produces a loud volume and high fidelity through an orthophonic folded horn. The electronic Super-Tone model first used the orthophonic horn with a driver, and later switched to a conventional loudspeaker arrangement. While the mechanism is substantially unchanged from the Deca-Disc, one its defects – the weak electric motor – was changed. The Electramuse uses a smooth induction disc motor for the turntable, and the mechanism is powered by a second geared electric motor. These changes increased the record capacity to up to 10 records, while providing smooth and trouble free operation. Since records in 1926 were all produced with a run-off groove, the geared trip mechanism of the Deca-Disc was abandoned in favor for a simple ratchet mechanism (for Victor records) combined with a fixed-position trip (for Columbia, Brunswick and other makes). All other functions are basically identical with the original Deca-Disc mechanism.